Are you bloated, lazy, moody, depressed, overweight, obese? How much sugar do you consume? I honestly believe that Sugar is not fit for human consumption. Literally every single organ in the body is negatively affected by sugar. Get this, It’s been said that one teaspoon of sugar lowers your immune systems response for four hours. Think about it.. if you have something sweet at each meal your immune system may be operating at a distinct disadvantage. Thus contributing to any conditions or illness you may already have. Sugar will only increase your suffering and make it harder to get better, no matter what it is you are dealing with. Also, since sugar is ‘nutritionally naked’, the body must ‘borrow’ the missing vitamins, minerals and other synergistic nutrients required to metabolize sugar from its own tissues. Heavy sugar consumption therefore causes a constant siphoning of nutrients from the body. Recent evidence suggests that sugar causes dental problems not so much by contact with the teeth but rather by leaching the teeth of calcium from within. It also depletes the body of potassium and magnesium, which are required for proper cardiac function, and is therefore a major factor in heart disease. The nutritional leaching caused by sugar can cause intense food cravings and eating binges, as the body seeks to replenish the nutrients ‘stolen’ from it by sugar. No wonder people are obese and always sick! 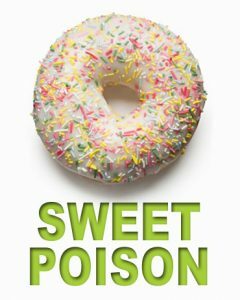 How does sugar promote inflammation? Inflammation is part of the immune response, and is not always a bad thing. However eating sugary foods can trigger excessive, inappropriate inflammation that can actually assist in aging and disease. How does it effect insulin levels? 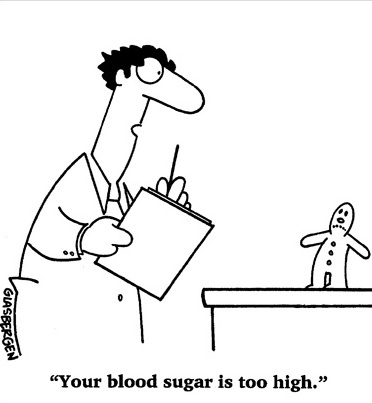 An influx of sugar in your body results in your blood sugar levels shooting up. Shortly after your pancreas will release insulin to help clear the sugar from your blood into your cells. As blood sugar levels go down, insulin levels return to normal. Except when you eat a lot of sugar, you’re constantly seeking insulin, and that can backfire in a couple of ways. Over time, your body will depend on more and more insulin to get the job done. Eventually, your pancreas may just stop responding. Applaud, you’re now an insulin-dependent diabetic. Not to mention you have exposed your cells and organs to chronically high insulin levels in return accelerating the aging process. How does it suppress the Human Growth Hormone? You know when your in line at the grocery store and you see all of the gossip magazines with pictures of celebrities, that never seem to age? Well most likely they are injecting themselves with human growth hormones. Of course, they may also be watching their diet and spending some time in the gym. But there’s no doubt hormone shots have a lot to do with their physique. Hormone treatments are expensive, risky and slow down the aging process. Without relying on injections, you can naturally enhance your body’s production of human growth hormone. Simply stay away from foods that are high in sugar, exercise and avoid excess stress. For all of these reasons and countless others, you can see the consumption of sugar is dangerous and causes far too many health problems. Like just about every other manmade food, sugar is unnatural. Now I know some people may argue that, but it is. Four hundred years ago there was no such thing as sugar. We ate nothing but wholesome, nutritious foods that came from the earth naturally. The only food that came close was real, raw honey (which looks nothing like the stuff you get in most grocery stores). That means no more pre, during or post workout shakes containing any sort of sugar. Next time you’re buying protein check the ingredients for what type of sugar they are putting in it. Some common ones you will start to recognize are: dextrose, glucose, fructose, sucrose, sorbitol, and many others. These types of sugars are the same as table sugar, and once they are inside the body the adverse health reactions are the same. You can still have a high quality protein shake, but skip the sugar. Try using brown rice, hemp or even pumpkin protein that has no added sugar. If you are looking to gain mass and need some carbs just add some oats or a sweet potato to your shake. Eating some carbs like rice or potatoes, post workout is far healthier than “liquid sugar” from a protein shake. Of course we all have the need to satisfy those sweet cravings, so do it in a healthier manner. Organic, raw honey is a great alternative to sugar. It has prebiotic, immune and health supporting qualities to it. Also it can be cooked with since it’s unstable in heat. You can also make some delicious raw recipes with it. Like honey dates are also a great replacement in many dessert recipes (like some of the recipes we have posted). Bottom line ladies and gentlemen, sugar is an epidemic, a widely accepted drug being pushed down our throats (literally) and making our lives worse in every form possible. Sugar is killing us all, don’t believe me? Look at your life, cut sugar out and see what happens, I dare you. Did you see the book by Gary Taubes, supporting this proposal that carbs, and especially simple sugars, are the problem? Here is a link to my review of the book as an invited post http://goo.gl/yROme. On talking to him, he seemed like a knowledgable and reasonable person. He suggests that we actually should eat more fat, based upon careful research and good biochemical reasoning. Wonderful post! I’ve been avoiding sugar completely for about a week, and I ended up eating some today – I ended up feeling nauseous and dizzy! Also, to the person above, I would recommend you check out this youtube video series discussing low carb diets, including the work of Taubes: http://www.youtube.com/watch?v=egqf7k5Lzhk. It’s very enlightening. The annoying thing is that our body craves sugar and junk food when we are emotionally down and we least need it!